Fellow Denverite, when your out-of-town guests come to pay you a visit and have never been to Denver before where do you take them? After they tell you how amazed they are that the sun is shining so bright and that there are so many tall buildings and so few actual cows, where do you bring them to eat something quintessentially Denver? And I don't mean what Denver is now-- no, not one of the plentiful new, excellent, hip eateries-- but rather where do you go for something tried and true? A Denver tradition, so to speak. It's a tough question, and it gets tougher. Where do you bring your wife's Mexican cousin who has never even been to the United States before? Where do you bring him at the end of his week's trip after he has already smothered his burrito with green chile, sipped a steamy pho, shared a shwarma, nibbled on some noodles, and tasted the buffalo for the first time? You don't bring him to eat tacos, that's for sure. Although there are some storied Denver taquerias, some quite different from Mexican taquerias, tacos aren't what you want to eat on your first vacation outside of tacolandia. After consulting with some friends in a text message flurry the likes of which my phone has never seen-- a quantity of texting that would make any pre-pubescent teenage girl madly jealous-- I decided on one of our cities most historic restaurants: The Bonnie Brae Tavern. I hadn't been to the Bonnie Brae tavern in years. Maybe ten or more. I remember going with some Denver friends who had been raised on the place and I remember thinking how great I also would think it would have been if I also grew up eating there. 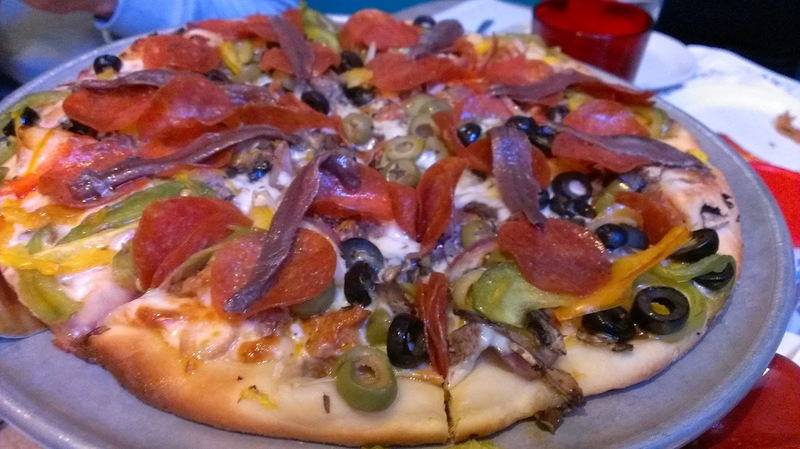 I remember thinking how rarely I eat pizza with anchovies and how fantastic it was. And I remember thinking, besides the anchovies and the ridiculous stack of other meats and veggies on our pizza, it wasn't necessarily all that great of a pizza. This time around I felt about the same as far as the pizza goes. The plain pepperoni was fair, and the House Special--the aforementioned anchovy-laden meat and veggie combo-- was great again because of those salty little fish and because there is just something so American and so heartwarming (and heart-stopping) about putting as much food as possible together at once--in this case on top of a pizza. This time around I also had the green chile. I never would have thought to go to Bonnie Brae tavern for green chile, and I probably wouldn't have even ordered it if my curiosity wasn't piqued by the big 5280 Banner inside, touting it as the best of 2013. Shows you exactly how much I know. 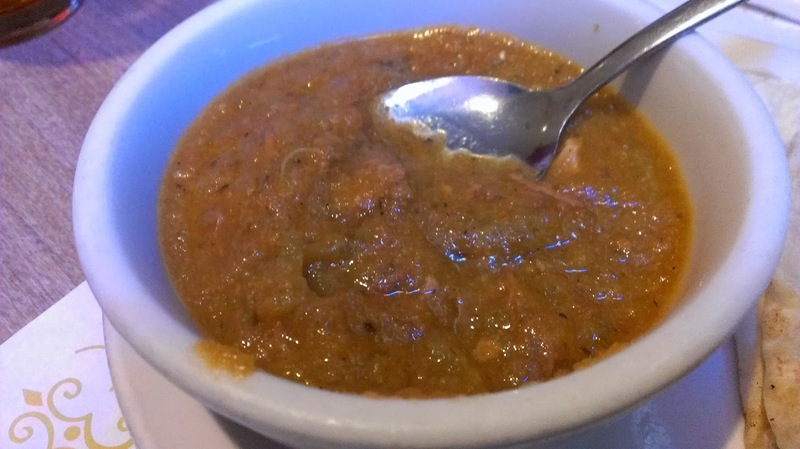 This little bowl of chile, although not spicy in the least, and almost the consistency of a lentil soup had delicate layers of rich flavor: green chile, tomato, garlic, cumin. Simple but with fantastic depth. Truly one of the better bowls of green chile in Denver as far as I'm concerned-- even without the heat. This time around I also appreciated the place itself. In addition to introducing our cousin to a slice of Denver tradition, it was also the birthday of my twin boys. They were elated when their names were announced over the restaurant loudspeaker (by the way, what other restaurants can you think of that still use a loudspeaker?) upon delivery of our desserts, and then just about jumped out of the booth with joy when the entire restaurant broke out singing happy birthday to them. It's certainly one of those times when-- for good reason-- families start to feel a bond to a place and return--maybe not because it is the best food they have ever had, but because of the memories they start making there. 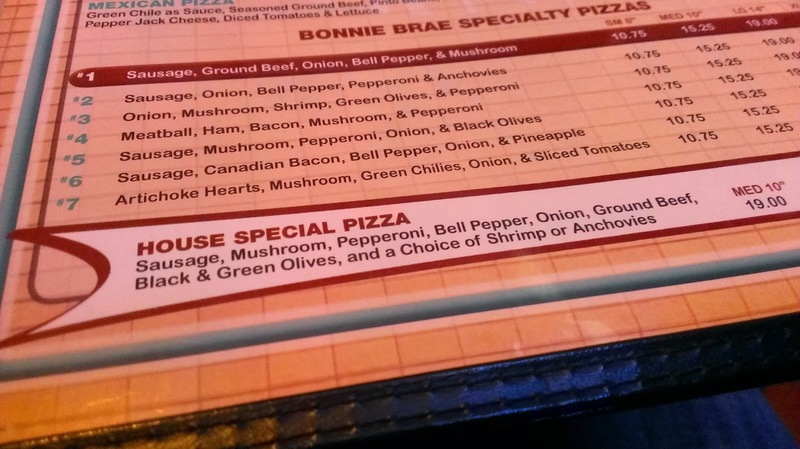 So here's to Bonnie Brae Tavern as a heartwarming place to eat a ridiculous pizza, a great green chile and just to soak up the history-- 80 years to be exact. In a young city like Denver, 80 years is pretty amazing. Aww, the loudspeaker story is cute! I remember enjoying Bonnie Brae Tavern's Rueben sandwich and I normally don't like cured meats and veggies. Did you take your boys and wife's cousin to ice cream across the street?